Near the “top” of Lake Michigan lies the little town of Naubinway, meaning Place of Echoes in Ojibwe. The echoes of the lumbering operations that first attracted Europeans to the area have long since faded from the memory of all but the most historically minded. The fishing families that followed the loggers and lumber barons have managed to sustain their livelihood, but not without significant struggles. The Frazier brothers--Carl, Don and Allen--are from such a family, determined to wrest a living from the lakes and from government regulators who implement legal consent decrees and can determine who can fish commercially and where. The Frazier brothers’ grandfather started fishing part time in the 1920s, and the boys became interested in what he was doing. As a young man, Carl worked for a while with Bob Sellman in Manistique, where he learned a lot more about the business. 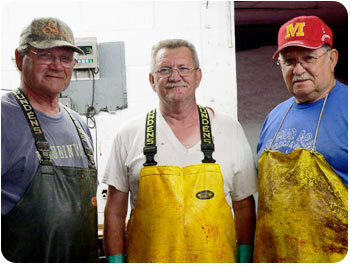 And when whitefish started coming back in the mid ‘60s, Carl and Don started fishing under the ice, while their brother Allen managed the processing shed. At first they fished gill nets, but switched to trap nets when the Bureau of Indian Affairs required it. “We had the boats paid off and thought we were going to be able to save some money for a rainy day or retirement. But they disqualified us from fishing by rejecting our tribal documentation, and it took more than 10 years and lots of money to be recognized. Now we’re adopted members of the Sault tribe,” Carl says. Not surprisingly, then, Fraziers like being their own boss. It’s a new challenge every day, whether getting back into the Swedish market or competing with government subsidized product from Canada. “We’re certified with the Food and Drug Administration’s Hazard Analysis and Critical Control Point program and we provide premium whitefish fillets. We also smoke fish and dress some, so we’re pretty versatile,” Carl says. Coping with those challenges is one thing; ridding the lakes of invasive fish species and zebra mussels (and the associated slimy Cladophora that fouls their nets) is something beyond their control. Frazier thinks lake managers need to be more careful with regulations to prevent further damage to the fishery. As much as he personally enjoys the fishing life, Carl doesn’t expect his son to follow in his footsteps. He has a college degree and works in southern Michigan, and Don’s sons are employed by another area fishing family. This story posted in Fishing Families on Great Lakes Whitefish website (view PDF version of original web content). This profile is also published online by the Michigan Fish Producers Association ('The Fishermen' ). More Information: The Life of a Commercial Fisherman, Carl & Don Frazier, Inc.